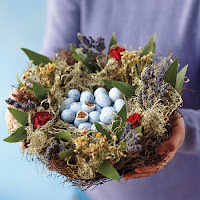 Tosha provided the CCEE Stampers with a beautiful bird's nest inspiration photo from Williams-Sonoma for our challenge this week. The bird eggs are truffles! Yum! We were to create a card/project around whatever inspired us, whether it be the colors, textures, flowers, eggs, whatever came to mind. I drew upon the colors of green and lavender with a splash of red, as well as creating the octagonal shape to somewhat resemble the shape of the bird's nest. I stamped the Pocket Silhouettes image in Old Olive, Almost Amethyst, and Lavender Lace and sponged Barely Banana and Bashful blue for the background and sky. The sentiment and music note are from Happy Days by There She Goes. The red flower is felt, and I used my Cropadile to put an Old Olive eyelet in the center of it, as well as a black brad. 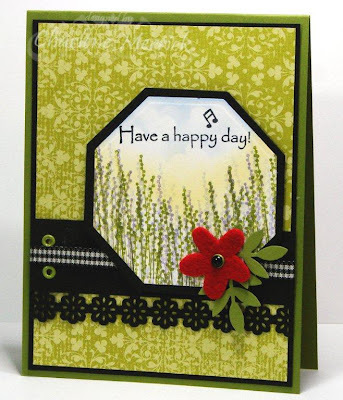 The background dp is from SU's Bella Rose collection, and I love this MS flower border punch! You can check out the cards/projects my friends made on our CCEE blog, as well as get the details for playing along with us! ooooooooooooo i see where you came from on this one. it's beautiful! Just beautiful, love how you used the colors from the inspiration piece. I really like the border. Charlene, this card is wonderful.......and thanks for removing the truffles...I'm fat enough!!! Oh is this purty or what? I love your silhouette image stamped in the soft subtle colors...gorgeous, and your musical notes adds a touch of whimsy...so sweet and full of spring's promise, Charlene!! This is just beautiful, Charlene! Love the scene you created for that beautiful inspiration piece! Serene and Beautiful! This is gorgeous! Love everything about it, Charlene. the colors, the scene and all the wonderful embellishments. What a super design. i saw this beauty on the CCEE blog but wanted to leave a comment here too! Beautiful Charlene!